I'm in a flurry of beads and have been beading my heart out! LOL!!! My mother became enamoured with a pin that I have and requested some for christmas pressies for her friends! Soooo.... after making a bunch of faces... she selected these and gave me the color specifications for each person! It was important that they all be "furry" so thats what she got! LOL!! The bottom white one truly has a face, but after a loooooooooooonnnnnggg day of trying to get her features to pop... I had to take the beading off, re-apply it to a newly made face and i'm NOT touching it ! LOL!! Good grief! If I only had painting skills! VBG!! Enjoy! This is Diane's second block! 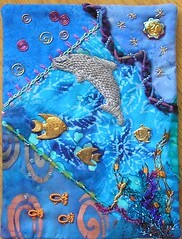 The dolphin is stumpwork that graciously donated along with her wonderful brazilian fishies and charms and beads and..... Thank you SO much Diane! This is the first of two blocks that have just come in! They are SOOO wonderful!! Diane Foote graciously asked if she could participate AND if she could make 2!!! OMG!!! I am just THRILLED with these blocks and am SO very happy to have them join the other blocks!!! Thank you, thank you Diane! Lynn's other block in the sampler rr! Another button cluster and the cretan stitch in a variation and plain both with beads! Enjoy! Finally....this is the second block in a sampler rr I participated in! 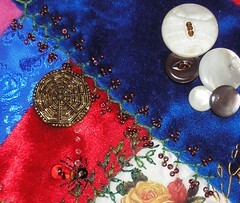 I added a button trail, a separate button with a spider web look to it and the beaded spidey. I also stitched the cretan on the seam and added some beads for little flowers! This is another rr block for an Encrusted rr I joined! I went rather nutz I think with the bead trail...but... well....she wanted buttons! LOL!!! 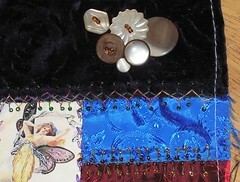 I then did a ton of beading.....from seam treatments to accents to the frame around the pic! Hopefully she will enjoy it! Now for the beginning of the rr block roundup! LOL!! 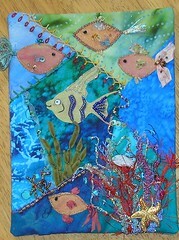 This is the work I did for Jo Newsham in the beaded block rr! 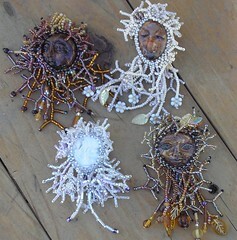 I gave her a beaded vine and spidey web with a little beaded spider. I have recently found some great filigree things so I added a butterfly to round things out! HI everyone! 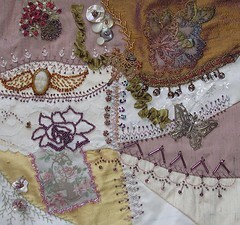 Been just a bit since I posted... been stitching away!!! This is a block I did for a group "sister" who is going thru a very hard time right now, so a bunch of us banded together to make her a wall hanging. I am a beading nut these days it seems!! 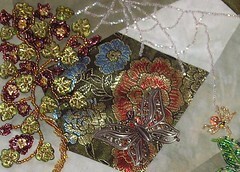 But they add a great dimensional quality to the embroidery I think! This is my final Spirit of Friendship doll! I'm hard pressed to let her go....but her wings have been fluttering in anticipation so I had best let her fly! 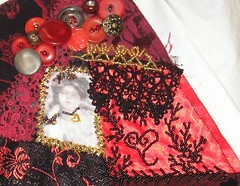 This is to introduce mistress butterfly for the spirit of friendship doll swap! I've been a beadin' fool this week! LOL!! Beads are everywhere and on practically every seam! I made all the faces for these gems along with the flower you see on the front here. This is Flower Spirit! She will be flying off with her two sisters to partake of the Spirit of Friendship swap! I hope this is ok....i've not beaded a face like this before....hopefully her new mom will enjoy her. For any of these dolls, you can click on the pic and it ought to take you to my flickr account where you can see their backs as well! Heres her back. This is the only doll I didn't cq for the back also. So I beaded my "moniker" on her bottom...which also means peaceful heart...and hopefully soothes a soul! This is another comfort doll sister! Light of heart and peaceful! And here is her back. Lots of beading, embroidery and cute flower sequins on her! I'm hoping she will make someone smile!